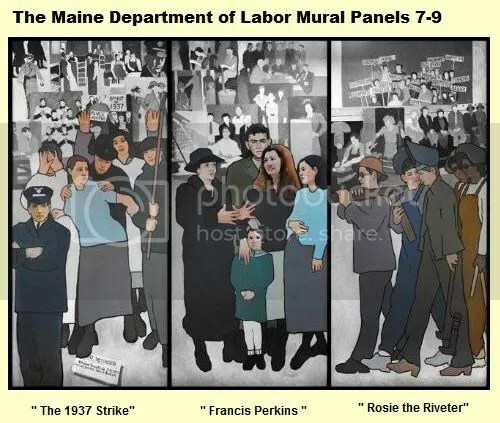 Panels 7-9 of the Maine Labor Mural.Day 77 of the LePage Administration, March 22: The beginning of Mural-Gate. Today staff of the MDOL learned that this mural would be removed. In an email, Acting Commissioner Laura Boyett made the announcement, along with news that some of the names of the meeting rooms would be changed, names like the “Perkins Room.”Frances Perkins was FDR’s Secretary of Labor, the first woman in American history to head a Federal department. The hunt for a new Commissioner is taking longer than anticipated but the search continues. However, the work of the Department of Labor is important, critically needed and cannot be put on hold until a new leader is found. When a new Commissioner is appointed, he or she will find a vibrant, progressive agency; staffed by people committed to delivering quality services to the citizens and businesses of Maine. I am confident of this because it is what I see when I come into the office every day and I am proud to be part of such an outstanding organization. Maine has just come through one of the most difficult economic crisis in almost 75 years and we still face significant challenges as we recover. The Maine Department of Labor can play a pivotal role in this process. For the Maine economy to thrive, we need strong businesses and skilled workers. They are two sides of the same coin and neither can succeed without the other. The Department of Labor serves both constituencies. We assist businesses in navigating the complexities of the regulations they must operate in, help them to set up safe environments for their workers and connect them with workers possessing the skills needed for their businesses to succeed and grow. We help and support workers through the difficulties of unexpected job loss, connect them to new jobs and provide them with the skills needed to achieve their career goals and succeed in the marketplace. We bring workers and businesses together to build a strongMaine economy. This is our charge and our vision for moving forward. The important work of this agency is not on hold or in limbo pending the appointment of a new Commissioner and I, along with the Acting Bureau Directors, are committed to leading us forward in this direction. We have received feedback that the administration building is not perceived as equally receptive to both businesses and workers – primarily because of the nature of the mural in the lobby and the names of our conference rooms. Whether or not the perception is valid is not really at issue and therefore, not open to debate. If either of our two constituencies perceives that they are not welcome in our administration building and this translates to a belief that their needs will not be heard or met by this department, then it presents a barrier to achieving our mission. I will be seeking a new home for the mural and we will be renaming the conference rooms in our administrative office at Commerce Drive in Augusta. However, I’d like your help in coming up with new names for the conference rooms. I’m holding a ‘renaming contest’ and will select from your suggestions. The names can be places, concepts or things but should not reflect a bias toward either business or workers – the names should feel welcoming to both. Although arguments can be made that some of the existing names do not reflect any bias, to keep things simple, we are going to make a clean sweep across the board and change all. Therefore, we need naming suggestions for 8 conference rooms. Send your suggestions to Neena Quirion by close of business on April 5th. There will be a small prize for the successful author or authors so put on your thinking caps! As I hear news on the Commissioner search I will pass it on to you. In the meantime, businesses and workers are counting on us to help them during challenging times and after 17 years of working with you at MDOL, I know I can count on all of you to continue to do just that. At first, it was reported that “an anonymous fax” sent to his office was what caused him to make the decision to remove the mural. After some pressure, LePage’s office finally released the supposed “fax”. It was quickly noticed that the “fax” had no date or time stamp nor phone number sent- all of which would normally be on a fax. Adrienne Bennett, LePage’s spokesperson, dismissed this astute observation and revised the document to instead be a letter received by their office. If you look in the upper left area of the letter, there is something else on the paper.I believe it is the seal that exists on the state letterhead of every modern Maine Governor, and is showing up through the white-out hastily applied over it. Why did this thought occur to me? Because I find it simply impossible that this man has “a secret admirer……..” out there. Day 80 (March 25): Maine Women’s Lobby Asks: What Would Frances Perkins Say? Day 80 (March 25): Playing Musical Chairs With the Maine Dept of Labor Mural? Indeed, there was a “new mentality”. Hours after that weekly address was released, the mural was secretly and quietly removed from the MDOL reception area, packed away and to date, has not been seen since. MDOL employees returned to work Monday to find clear damage to the now bare walls, stripped of the 11 panels of artwork. Both the governor and the artist, Judy Taylor, issued statements about the mural removal. It was reported on Day 84 (March 29) that despite being on the job for less than 3 months, Governor Paul LePage was taking a full week off for a vacation in Jamaica with wife Ann. But even the Governor’s absence did not stop “Mural-Gate”, which evolved into a lawsuit and a temporary restraining order being filed against LePage. As well as an outcry for a citizen’s recall process. And news of a death threat against the Governor. Day 87 (April 1): Rep. Cynthia Dill Asks: Citizen’s Recall- What Now? A large rally was held in the Statehouse’s Hall of Flags, also on April 5th. Here is Rob Shetterly, President of the Maine Union of Visual Artists addressing those assembled. “Governor LePage’s attempt to discredit and suppress history serves as another kind of reminder about how easily it can be lost and why. He has tried to neuter the Department of Labor by removing the true soul of its mission. He has tried to tell us that organized labor in defiance of a vastly more organized business community is unfair, not balanced. He would have you believe that organizing to struggle against social and economic inequality is somehow un-American and bad for business. He knows our history so little, or forgets it so well, that he does not know that the only, I repeat, the only, reason we have freedoms and equalities in this country is because of idealistic, organized struggle by people who had been marginalized for others’ profit. And the presumption of removing Cesar Chavez and Frances Perkins, great heroes of our democracy and social equality, as names of committee rooms, is like deciding to tell the story of our Revolution without mentioning Tom Paine or Sam Adams. Just as we cannot be true citizens if we forget our past history, as citizens today we cannot fail the obligations of our current history. The mural must be returned. We will not fail. I am reminded by these events of the great Civil Rights activist Fannie Lou Hamer who said, “I am sick and tired of being sick and tired.” I am sick and tired of the crude disrespectful remarks of this governor. And now, I am especially sick and tired of his arrogant and — how else to call them — stupid comments about this labor mural. He calls those of us who would stand in the way of its removal “idiots” deserving of his ridicule. If that’s the case, then every conscientious struggle for dignity and fairness, democracy and equality, justice and decency in our history, deserves his contempt. And, I’m sure he would freely give it. He may be arrogant and stupid, but he is not naïve. And LePage’s decision to remove the mural secretly was one of the most cowardly acts I have witnessed. If he believed he was right about removing it, that its eradication was good for the people of Maine, he would have done it in daylight, and been there himself to take credit for protecting us from art as propaganda. In fact, he would be here right now, if he had the courage of his words. Rarely has an elected leader made clearer the difference between respect accorded to an office and respect earned by its holder. 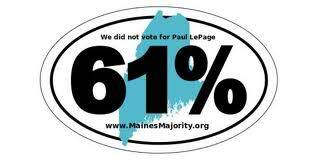 Paul LePage has embarrassed himself, not us. Disgraced himself, not the state of Maine. The embarrassment and disgrace will be ours if we fail. We demand that the mural be returned, we demand legislative protection for the rights of labor from the predatory attacks of organized capital, and we demand leadership worthy of the good people of this state. Day 97 (April 11): Video: “Welcome Back, Governor LePage! Sidenote: What the heck is “Government Speech”, anyways? One June 15th (Day 162), the case went to court and the court documents were made available (pdf warning). Among other things learned was that LePage had the mural taken down, sight unseen. So, for a few months more, not much was said about the mural. No one knew where it was, the Maine Labor Mural Facebook page continued to keep people updated and grow its membership, and we waited to see what happened next with the only recourse left- the legal system. Check out the a reproduction of the 11-panel mural depicting Maine’s labor history that the state’s governor has banned. It’s on display now through Oct. 11 at the AFL-CIO headquarters in Washington, D.C.Maine Gov. Paul LePage ordered the original mural, by artist Judy Taylor, removed from state property in March and continues holding the artwork hostage. The mural depicts the state’s labor history, including a 1986 paper mill strike, “Rosie the Riveter” at the Bath Iron Works and the enactment of child labor laws. The Maine AFL-CIO is leading a lawsuit to force LePage to return the mural to its previous display site at the state Department of Labor. Then Governor Paul LePage decided to accept an invitation to participate in the NBC EducationNation Governor’s Forum on September 26 in New York. Host Brian Williams decided to ask an unprepared LePage about the mural and suddenly the Governor had an brand-new, never before reported reason for why the mural was taken down; here is the clip. Kennebec Journal (opinion): How’s that? LePage’s problem with mural wasn’t its content? At a Town Hall meeting last April in Topsham, LePage provided more detail of the funding for the mural, claiming that $38,000 came from the Federal Government and the remaining $22,000 from Maine’s Unemployment Insurance Fund.Should this $22,000 be repaid to the Unemployment Insurance Fund, wouldn’t Gov. LePage have to keep his word and return the mural to its original location? The Administration originally removed the mural because of its messaging. The mural portrays only one party that the Department of Labor serves – workers not job creators. In order to change the culture the decision was made to find a more appropriate location for the mural.It was then discovered how the mural was funded and that these funds could have been put into the Unemployment Trust Fund for Mainers to benefit from. When the Governor learned of this it further supported the decision. The Governor took part in this panel discussion to speak about education; however, it is clear that NBC had an entirely different agenda for Governor LePage. With limited time to answer the question the Governor chose to speak about the most disturbing aspect – that this money could have been put into the Unemployment Trust Fund rather than used on a mural. This information was underreported by media this spring. The Maine AFL-CIO is deeply disappointed in the Governor LePage’s latest comments regarding the labor mural made during an appearance on an NBC Education Summit earlier this week. Governor LePage’s explanations for removing the mural have changed numerous times now. Initially the mural was removed because of an “anonymous letter,” then it was too “one sided” and now seven months later Governor LePage has a new explanation. The real issue, however, is not the Governor’s motivations; it is his actions. The Governor’s decision to remove the mural disrespects generations of hardworking Maine people and erases their history. It is also part of his divisive, anti-worker agenda which has included rolling back child labor laws, attacking collective bargaining rights and undermining the retirement security of retired teachers and seniors. The Governor has had every opportunity to take the high road, admit he made a mistake and end Maine’s mural embarrassment. Instead of making new excuses and spreading disinformation, he should restore the mural to its proper place. The Reed Act permits a participating state to use its Reed Act funds, under an appropriation by the state legislature, for the administration of its [Unemployment Compensation] law and public employment offices. The state properly complied with this requirement in paying, under an appropriation, 63.39 percent of the commission from the Reed Act funds in its [Unemployment Trust Fund] account, since the display of this art work in your headquarters served these administrative purposes. Indeed, a 2003 Maine law, LD1552 “An Act To Allocate a Portion of the Reed Act Distribution of 2002 To Use for the Administration of the Unemployment Insurance and Employment Services Programs,” set aside $9,760,000 of a $32,486,816 Reed Act grant to pay for administrative expenses, including expenses associated with offices, technology and accessibility. The mural funding in question appears to have come from this administrative allocation, not from the remaining monies which were reserved to provide unemployment benefits. This is still a developing story and as such, will be updated as needed. It appears LePage is now taking issue with a portion of the mural expenditure that was paid for with federal Reed Act unemployment insurance funds. However, in April of this year an official with the U.S. Department of Labor informed the Maine Department of Labor that the the mural expenditure was justified:The Reed Act permits a participating state to use its Reed Act funds, under an appropriation by the state legislature, for the administration of its [Unemployment Compensation] law and public employment offices. The state properly complied with this requirement in paying, under an appropriation, 63.39 percent of the commission from the Reed Act funds in its [Unemployment Trust Fund] account, since the display of this art work in your headquarters served these administrative purposes. Indeed, a 2003 Maine law, LD1552 “An Act To Allocate a Portion of the Reed Act Distribution of 2002 To Use for the Administration of the Unemployment Insurance and Employment Services Programs”, set aside $9,760,000 of a $32,486,816 Reed Act grant to pay for administrative expenses, including expenses associated with offices, technology and accessibility. They are clearly scrambling in the Governor’s office today to come up with a plausible explanation for LePage’s comments to host Brian Williams during NBC “Education Nation” gubernatorial forum. LePage’s words contradicted his earlier statements regarding the mural’s removal, as well as testimony presented on his behalf. “The Administration originally removed the mural because of its messaging. The mural portrays only one party that the Department of Labor serves – workers not job creators. In order to change the culture the decision was made to find a more appropriate location for the mural. It was then discovered how the mural was funded and that these funds could have been put into the Unemployment Trust Fund for Mainers to benefit from. When the Governor learned of this it further supported the decision. The State Legislature gave final passage to a bipartisan plan for redrawing Maine’s Congressional district lines today during a Special Session of the Legislature. The compromise plan moves Waterville and Winslow into the First Congressional District and puts Unity Township, Albion, Sidney, Belgrade, Rome, Vienna, Mount Vernon, Gardiner, West Gardiner, Monmouth and Randolph into the Second Congressional District. It splits only Kennebec County and brings the population difference between the districts to a deviation of one. The plan is a significant departure from the GOP’s initial radical plan that proposed to move 360,000 people, seven counties, and 139 communities to a new district. Last week, the Republicans announced they would likely ignore the law and force this partisan plan through with a majority vote. Democrats had offered three moderate proposals, which moved only a few towns within Kennebec County, which is already divided between the two districts. Republicans rejected those proposals during negotiations over the summer. A federal court ordered the Legislature to redraw the line between the districts based on new census data in response to a lawsuit earlier this year. The plan now must be signed into law by the governor. AUGUSTA- The Maine Legislature passed a bill to strengthen the penalties for users and dealers of the illegal synthetic drug bath salts. “The bath salts epidemic this summer has prompted the legislature to take emergency action on this critical issue,” said Rep. Seth Berry, D-Bowdoinham, who is a cosponsor of the new bipartisan bill and was the sponsor of the original bill that made the drug illegal earlier this year. Berry’s bill was scaled back to be a civil violation in the spring due to a lack of funding needed to pay for incarceration, treatment, and indigent legal services. The abuse of bath salts has ballooned across the state over the summer, according to law enforcement officials. The epidemic prompted the governor and lawmakers to reintroduce Rep. Berry’s original proposal to make the penalties equal to drugs like heroin and methamphetamine. Nationally, Poison Control Centers recorded 303 poisonings in all of 2010. In the first seven months of 2011, they recorded 4,137. In Maine, Bangor has seen an increase of Bath Salts cases in the past few months. The Bangor Police Chief Ron Gastia told the Criminal Justice and Public Safety Committee on Monday that there were 14 bath salts related incidents this weekend alone. During the debate on the bill House lawmakers rejected an attempt by the Senate to amend the bill to scale back the punishment for furnishing versus trafficking of the drug. The bill will now be sent to the governor to be signed into law. (Huh??) Governor LePage took a trip down to the Big Apple this week to participate in a panel discussion for NBC’s “Education Nation”. He was one of ten governors invited to the event. Governor LePage told the group that he believes Maine doesn’t need to spend more money on education, but that it should do a better job making sure more education funds go into classrooms.He also says he’s learning a lot from how other countries educate their kids. Governor LePage will focus on leading the global economy. Two-thirds of the jobs created in the U.S. over the next few years are expected to require at least some college education, and if the nation is going to compete with its global competitors, the pathway is through emphasizing high skills and innovation. Yet states continue to struggle with creating a successful pathway from K-12 to college graduation – especially for the students and workers who need the economic boost of higher education the most. And as high-demand, high-growth science, technology, engineering and math (STEM) careers become increasingly mobile, the competition is sharp. LePage suggested a series of reforms, sometimes extolling his views of problems in the system in his signature gruff terms. “We should strive to have each campus become a true leader in a given area, rather than multiple campuses overextending themselves in a hodgepodge of unfocused endeavors,” wrote LePage, who also called for noninstructional staff positions to be reduced systemwide in favor of hiring more professors and instructors. LePage also urged the system to require more productivity of employees, such as professors taking on more graduate students and giving cash bonuses for high productivity or securing grant funding. “Since the system is currently involved in contract negotiations, this may be an ideal time for its leadership to demand more from its employees,” wrote LePage. LePage also suggested a “top-to-bottom review” of services offered by the university and community college systems and the consolidation of duplicative efforts. “A comparison of all employees and their functions may reveal significant duplication of efforts,” wrote the governor. It really is a case of he only knows one business model- that of Marden’s. That, or as he only has a hammer, everything before him looks like a nail. AUGUSTA – Republican state lawmakers will likely force through their radical plan to draw Maine’s congressional map during a special session of the Legislature on Tuesday. The majority party will ignore the current law that requires congressional maps to gain 2/3 support from the Legislature or be drawn by the State Supreme Court. The Republican bill released today, LD 1590, includes a technical “Notwithstanding” clause in Section 2 stating that their proposal can be passed without the two-thirds support required by Maine law. This year Republican leaders in the legislature championed a Constitutional amendment to prevent this abuse of the process. The Constitutional amendment makes it impossible for the ruling political party to pass a reapportionment plan by majority vote. Voters must approve that amendment in November. But before that provision can take effect, the Republicans are now planning to push through their radical redistricting plan without any bipartisan support. Republicans have proposed a radical, partisan plan that would move 360,000 people, seven counties, and nearly 140 communities to a new district. It breaks up communities that share the same interest. It splits the shipyards, the mill communities, the coastal interests, and puts competing cities like Portland and Lewiston in the same district. This plan worsens the problem of the “two Maines” by creating one district that is mostly urban and another that is almost entirely rural. The Republican plan has been widely criticized across the state. Four out of five people that came to the State House for the public hearings on the two proposals testified against the radical plan. Five thousand people have signed an online petition against a radical plan. The bipartisan commission charged by the Legislature to draw Congressional district lines narrowly endorsed the Democratic plan. Democrats have presented a plan that shifts fewer than 20,000 people. It follows the current lines, which were drawn by the Maine Supreme Court nearly 10 years ago. The Republican plan adds approximately 10,000 Republican voters to the Second Congressional District. Here is Senator Debra Plowman (R-Hampden) presenting the GOP redistricting plan during the August 23 public hearing. Ultimately this plan was rejected by the committee. Republicans are putting forward their plan for redistricting, and may use the power of the majority to vote it through next week if talks fail to produce a compromise this weekend, Assistant Senate Majority Leader Debra Plowman, R-Hampden, said today.The Republican plan to change the line between the 1st and 2nd congressional districts is based on an east/west divide that puts Androscoggin, Cumberland, Oxford, York and part of Franklin County in the 1st District. The bill contains language that allows Republicans to approve the plan with a simple majority, rather than the two-thirds vote called for by current state law. Plowman said she hopes they don’t have to resort to the majority vote, but will if they have to. The question still remains whether or not this will go to the Maine Supreme Judicial Court. Bangor Daily reporting that the U.S. Census Bureau today will be releasing the latest uninsured figures today. But as it is based upon the 2010 census numbers, one wonders how accurate the numbers for Maine will be. Especially in light of news that the insurance industry is already raising premiums beyond reach of many small rural Maine companies. One company that left Maine but has now returned, Assurant, is now sending out expensive lil recruiting literature to all life and health (L&H) insurance agents in the state. Previously they did business under than name of Fortis, and had landed themselves in hot water with the State of Maine Bureau of Insurance, as did the company John Alden. More on Assurant here, John Alden here. Expect to see a LOT of these formerly disgraced companies coming back home to roost in Maine, thanks to LD 1333.There are many reasons they left Maine markets in the first place, and one would be wise to be skeptical of them as they return, as well as do their own research into the companies before they sign anything. In addition to Senator Plowman’s opinion piece today where she failed repeatedly and predictably to mention her (and others) many questionable connections to ALEC and MHPC, the Bangor Daily News ran one from Rep. Walter Kumiega (D-Deer Isle). One of those laws is the major health insurance overhaul Republicans pushed through a few months ago.We are already seeing the negative effects of this health insurance overhaul. The Ellsworth American reported recently that some small businesses in rural Maine will be seeing their health insurance costs go up more than 60 percent as early as October. According to the report, small businesses in Hancock, Washington and Aroostook counties will seeinsurance premiums rise more than 60 or 70 percent. One company in Presque Isle may see an increase of 90 percent. Premium hikes like these will put the companies at their breaking points. A recent survey of Maine people by Market Decisions found that 21 percent fear losing health insurance coverage in the next 12 months. Nearly 40 percent of those individuals said the top reason for their fear was the new health care law passed by Republicans in Augusta. It’s no wonder they are afraid. The insurance overhaul will allow insurance companies selling individual policies to set rates based on age at up to five times higher than the lowest rate. And, most troubling, there will be no limits on rate changes depending on where you live, or what kind of job you have. The new law expands that ratio to 1 to 5; that is, if the lowest premium is $500 a month, the highest an insurer can now charge is $2,500. The thought is that that insurers would increase the premiums for their more costly customers while – don’t laugh at this – lowering the costs for the young and healthy. Raise your hand if you can afford $2500 a month for health insurance. Yeah, me neither. During the floor debate, I asked this question to all the lawmakers in the House: “What effect will this have on premiums for a 50-year-old, self-employed fisherman living on an offshore island?” No one answered, either because they did not know or did not like the answer. This is just getting started and it’s going to get much worse before it gets better. Augusta, Maine – Pattie Aho has been nominated by Governor Paul LePage to lead the Maine Department of Environmental Protection. Aho, who has served as acting commissioner since June replaces previous Acting Commissioner and longtime Maine DEP Air Bureau Director, Jim Brooks. Prior to becoming acting commissioner Aho was appointed as deputy commissioner in April. “Patti has been an important leader in making the DEP a stronger and more effective, ‘customer-friendly’ agency,” said Governor LePage. “We can ensure sustainable economic development in Maine through a balanced stewardship of the state’s natural resources and she has already started to make that happen in her role as acting commissioner,” added the Governor. A native of Boothbay Harbor who graduated from Nasson College and earned a law degree from Western New England College, Aho has been in the forefront of environmental advocacy for over 25 years and has been active on many of the critical issues facing Maine, including energy efficiency, greenhouse gas and petroleum regulation. Admitted to the Maine Bar, she most recently served as an attorney at Pierce Atwood and as acting commissioner has been serving as Maine DEP’s primary liaison with both the Maine Legislature and the Governor’s Office, as well as representing the agency on several state and regional committees. The Maine Senate is expected to vote on Aho’s nomination upon returning to the State House during a special session September 27, 2011. Aho lives in Newcastle with her husband, Ron, and has a lengthy commitment to community service, having served on town boards and committees in both Boothbay Harbor and Newcastle and on the boards of the Lincoln County Community Theater and Orchestra and the Maine Tourism Association. She has also been honored with the prestigious Athena Award from the Kennebec County Chamber of Commerce for her advocacy on behalf of the business community.